Cheech Marin and nineteen other prominent figures have joined a California State University fund-raising panel. Their goal is to raise $100 million over the next five years for a new performing arts center. Cheech Marin and a host of other celebrities will participate in this year's BMW Charity Pro-Am golf tournament at The Cliffs. The event takes place April 28-May 1. We've obtained the transcript from last month's "Together Again" Cheech and Chong reunion at HBO's Comedy Festival in Aspen. For the second year in a row, Cheech Marin will be hosting the Trinity Classic Comedy Night. The Trinity Classic increases support and awareness for Trinity, a charity which provides children services and facilities. Tommy was supposed to be on the Allan Handelman Show last Sunday, but he experienced cell phone problems. Tommy will make another attempt this Sunday at 10PM EST. You can listen live on the web. Make sure you sign up for the pay service, the quality of the free connection is awful and not worth the attempt. Recap: Tommy says that right now he's working on various TV projects and is appearing on That 70s Show. He's also still writing the reunion script. 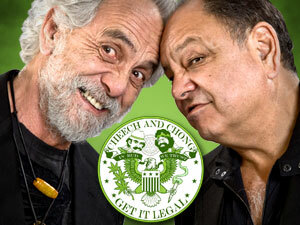 Chong says it will be the "best Cheech and Chong movie ever." As far as a movie title is concerned, "we're not going to name the baby until we see how it looks." For the first time, Chong revealed that he was in prison with Ronald Reagan's speech writer. The speech writer told Tommy that, before becoming President, Reagan was very familiar with marijuana.